This item is almost impossible to find in retail stores. I even had to purchase a new wallet to solve my problem. These will last me for a long time. Great for all my credit & insurance cards. Could not find this anywhere else. Use it to hold business cards. HEAVIER THAN THE OLD ONES. and put in my wallet and in my purse. i use the inserts for other things like; pictures, SS cards, medical cards and school id's. Credit Card Inserts are great. I have a lot of casino cards and plus I am a diabetic as well so I have a lot of cards all together to carry around in my purse and the credit card inserts I had in my purse before didn't have enough component in it to carry all of my cards but the Credit Card Inserts sold by Miles Kimball had more than enough components to carry all of my cards, every one of them. Great for organizing and protecting your important photos, misc. cards, etc. that you carry around with you. Seems to be an exact replacement. The price ws alot less than buying from the manufacturer. The only place that carriers all sizes . I checked all dept. stores for wallet incerts,they don't carry them any more,new wallets don't even have them!!!!! But miles Kimball had all sizes, so don't throw away your old comfortable wallet. This is a insert for a wallet. Hard to find. I use these insert to keep all of my loyalty cards organized and my purse clean. Using these inserts enables me to find my card quickly. I would certainly purchase this item againe. I have nothing but trouble finding this product in my local stores. When then arrived in the mail I could not have been happier. I grabbed all my photos and credit cards and put them in the new holder. I was very surprised with how many additional cards the holders held as compared to the old worn out holder that came with my wallet. My wallet is even thinner. I am, to put it simple over joyed. It is hard to tell which is which in the catalog. Would help if they were lettered. I wanted a holder for my credit cards and some other cards I carry and this is just perfect for my use. I keep a lot of cards in my wallet and this holds a lot of cards! I will use this for all my store reward cards. It will keep them more organized for me, and easier to find. These credit card inserts are hard to find in stores anymore, so I was happy to find them in my Miles Kimball catalog. My better half was happy, too, since they fit his wallet! This was to add to those compartments which are in my wallet. It works just great. 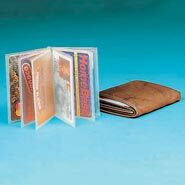 Keep cards neat and accessible. Hard to find product when you need extra photo or credit card inserts. Great for staying organized and seeing which card is where. saves serching through my wallet . making the most of my space. keeps cards in one place. Keeps all my credit and ins cards in one place. Easy to Flip to item I need. Great for keeping Credit Cards, Gift Cards, Business Cards all separated but viewable. I don't have to go through pockets to find what. Flipping through like a book. I use the credit card inserts but not for credit cards. In them, I put my driver's license, emergency numbers, health insurance card, doctors' cards, American Automobile Association card, etc. Every card is in my purse--exactly where it is easily accessible and easy to see. Will hold many cards and fit any ladies bag. It's simply a wallet insert that was very difficult to replace. I'm grateful for this company's offer. The insert's a bit more expensive and the business card compartments are notably smaller than the original Rolf's insert but it seems to holding up well so far. Prior to use I reinforce the front and back with clear packing tape as the plastic rips easily. I have ordered a similar product before, and was expecting one identical to past inserts. Unfortunately, this is not the same, and does not fit my credit-card holder......gave it away. These wallet inserts didn't fit the wallet that they said it was intended for they were too wide. Based on the description I believed it would fit my check register. It doesn't. And it would be too expensive to return. I will not order this item again as it was significantly smaller than the items previously ordered. want for storing cards at home - haven't found this in stores near me. Been searching to replace insert, finally found it! Exactly what I was looking for and easy to go through the purchase process. To be able to replace my husband's credit card inserts for his wallet. Not enough credit card sections in my billfold. convenience, not as many cards less chance of loosing. 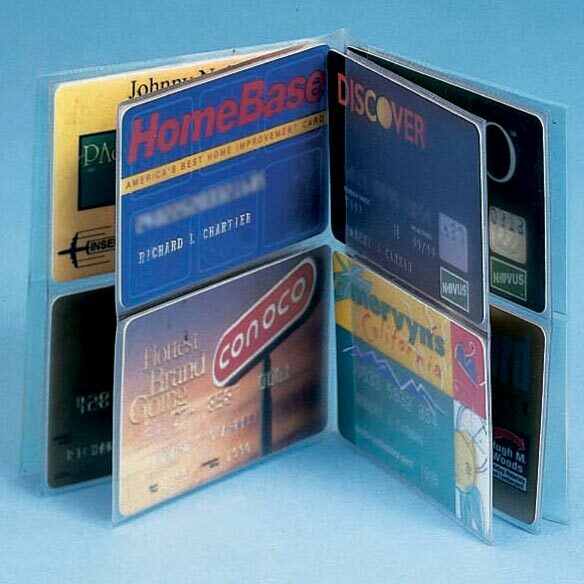 I choose the credit card inserts to replace my worn and torn checkbook card insert. Even though my checkbook inserts hold 3 cards downs, I choose these for the price. needed to replace the one in my wonder wallet. The card holder sleeve in my old RFID wallet wore out - maybe this will work in it. Old one toar and had to be thrown out, could not find any other place. My sleeve is old and cracking- this looks like it will work in my wallet. These did not work out well for me. I used them for a while. However they were sturdy and held their shape. I like to keep my cards in good condition. Need new one. Love the style for my type of wallet. MY SLEEVES ARE OLD AND BRITTLE AND I NEEDED NEW ONES. Need to replace sleeves, and these will fit current wallet. Could not find the item easily. always looking for earrin backs and credit cards need a home. My using one needs to be changed. every one who sees this wants one. there so handy for showing ID without everything falling out. Needed something to hold my stuff. BEST ANSWER: Thank you for your question. This item measures 3 3/4" x 4 3/4". We hope this information will be of help to you. Do you have a product that is close to 7# by 3#? BEST ANSWER: Thank you for your question. We do not have on the is 7"x3".We hope this information will be of help to you.